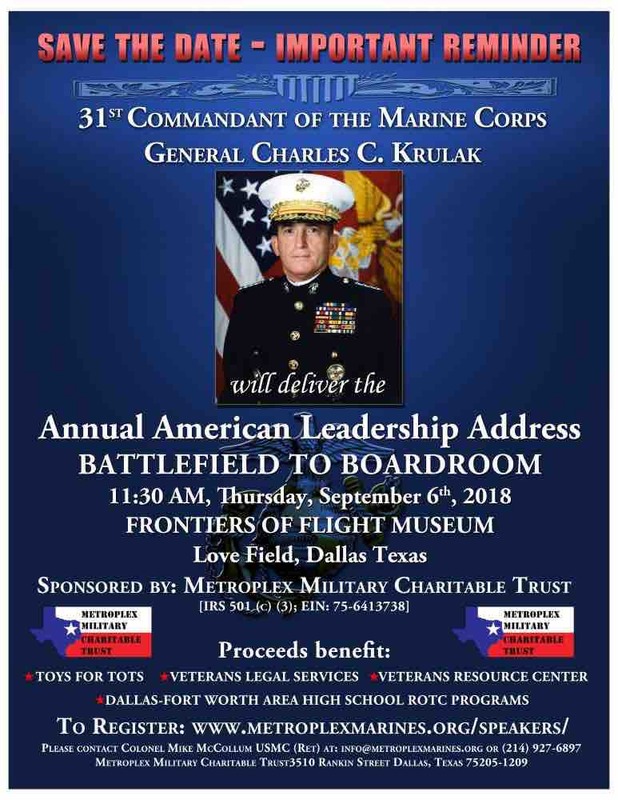 You're invited to hear General Charles C. Krulak, 31st Commandant of the Marine Corps, at the Military Speaker Series in support of the Metroplex Military Charitable Trust fundraising luncheon. What an incredible event! Mark your calendars for 6 SEP 2018! "From the Battlefield to the Boardroom" General Charles C. Krulak, 31st Commandant of the Marine Corps, keynote speaker at the Annual American Leadership Address. Invite your family, friends and colleagues to hear from one of our own Notable Graduates. You won't want to miss this! Register for your luncheon tickets! The Metroplex Military Charitable Trust (MMCT) announces the second of its Military Speaker Series fundraising luncheons. Since 1990, MMCT has been an avid supporter and creator of numerous military charities in the region. Noteworthy are the creation of the Metroplex Veterans Legal Services legal clinics; the underwriting of expenses for the local Toys for Tots campaigns, the extensive support of local high school Junior ROTC programs as well as the purchase of vans for the Veterans Resource Center to transport veterans to and from the local VA hospital. Please join us in experiencing historic military events as told by those who lived it in support of our country's freedom.